Lately, I have really been struggling with finding balance in life overall. The last few weeks, I have started to really feel overwhelmed and exhausted. I seem to always have something to do. I realized how exhausted I was, when I slept until 9am Sunday. I cannot tell you the last time I slept that late… 9 hours of sleep, and it was good, solid sleep. I was still tired all day and for the first time, did very little. I met a friend for yoga at 11, and it was exactly what my tired muscles and mind needed, then, relaxed most of the day other than laundry and grocery shopping. I was so exhausted, we went to dinner because I didn’t have the energy to cook. But, Monday morning, I felt refreshed, and had another good night’s sleep. But the overwhelmed feeling, it seems to be a reoccurring struggle I have with life. Work is good and busy, and with my commute, encompasses 45 hours of my week. Then, running takes up a minimum of 5 hours a week (but I love this), then, cooking dinner, playing with dogs, cleaning/laundry, friends, house hunting, studying for my certification, etc… and before I know it, it is late at night, and I am tired with a long to do list I haven’t gotten to yet. I get it that some people have children, etc and make it work, but for me, I struggle (and seriously commend those that run families, work and play… you all amaze me!). I am not going to divulge all the gory details, but there are many pans in the fire, so to speak, and goals that I am working towards. Some, although they seem daunting at the moment, are going to be better for me in the long run. Mortgage vs rent will actually be cheaper, certifications for work will allow for more income, devoting time to exercise will improve my health. I know the benefits to all that I am doing, but finding the time and energy to do it all right now, is my struggle. So, I decided I needed to get organized and prioritize. That’s the first step right? Why does strength training take a back seat? I don’t like it, so I don’t make it a priority. 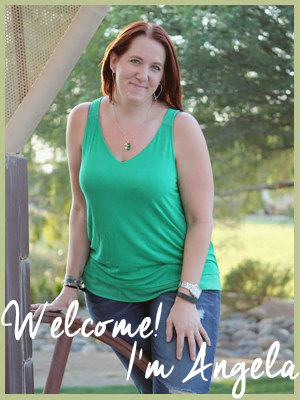 Back to the old, schedule it like an appointment trick…. Anyway… I went out and bought an organizing system. And honestly, for me, who is super organized, the signs that I wasn’t were huge red flags to me being overwhelmed. Don’t get me wrong, I LOVE my iPhone, but still struggle to go 100% digital. I am a scribbler. 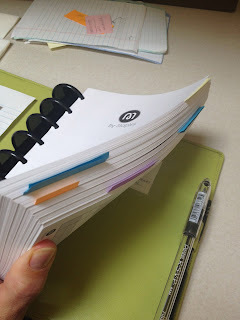 I have notes and post-its everywhere… when a thought comes to mind, I scribble it down. So, I needed to merge the work planner with the personal piles of notes. I literally had a work calendar, a personal calendar as a food journal, a notebook for ideas, notebook for to-do lists, a bazillion and one sticky notes. It was a mess. I bought the ARC by Staples set. I can customize, add and remove as needed (and it looked cool, it is GREEN!). So, on a slow afternoon at work (my brain was tired from the Child Abuse Mandated Reporter training I was at all morning), I began to organize, and set everything up, and tabbed it all… and transferred all my stuff from many piles, to this one place! 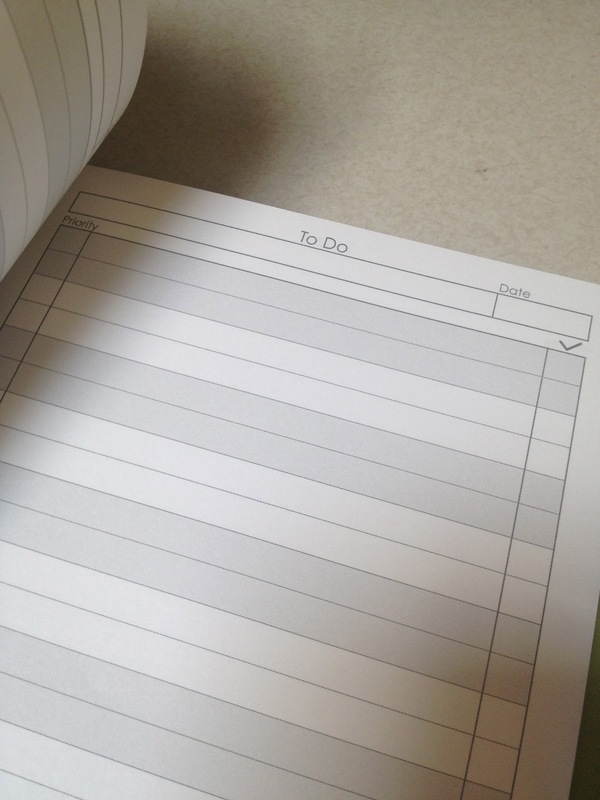 Please note that is the first and only time there will be a blank to-do list. Next step, prioritize…. and for those that know me, I am a LIST girl. LOVE lists!!! So, I am going to sit down this weekend and list what I currently have going, what I have as a plan, what is midway between a plan and occurring, and my wishes. Then, prioritize. From there… plan out everything, so I feel less crazy. I will also be writing in ALL of my workouts (yes run coach ALL of them, promise!) so that I actually do them, not just say: I’ll work my core tomorrow. 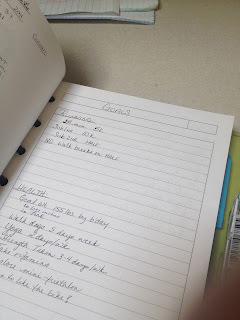 I will also journal what I eat, so I can break my plateau and drop the last 15-20 lbs. Your job in all this? Keep me honest… I know this will be new and novel for the first few weeks/months, then after that? Who knows… I fell in love with running, so maybe this will stick too. But keep on me, ask how it’s going, etc. Thanks!! Great post we might be twins. I started this year off and did the same thing. Write it down, sticky notes and all! You got this girl!! Thank you! I am usually very organized, but after finally getting my masters, just stopped using that part of my brain, lol. Getting back on track! I’ll let you know how it’s going!! I just went back and read this one. I think this is a fantastic idea. I may have to steal it. I like keep track online but it would be nice to have something handy, something I can put my hands on. Great idea Ange! 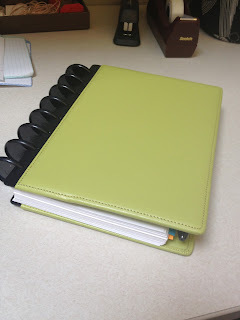 I LOVE this idea and organizer. I HAVE to look into it for myself. Did you find it at Staples? Thank you for posting and good luck with all of your planning!! Sara, thank you! I did find it at Staples, it is the ARC line. They have different covers plastic vs. leather, different size discs depending on how big you make it… I loved that I could buy what I wanted/needed. 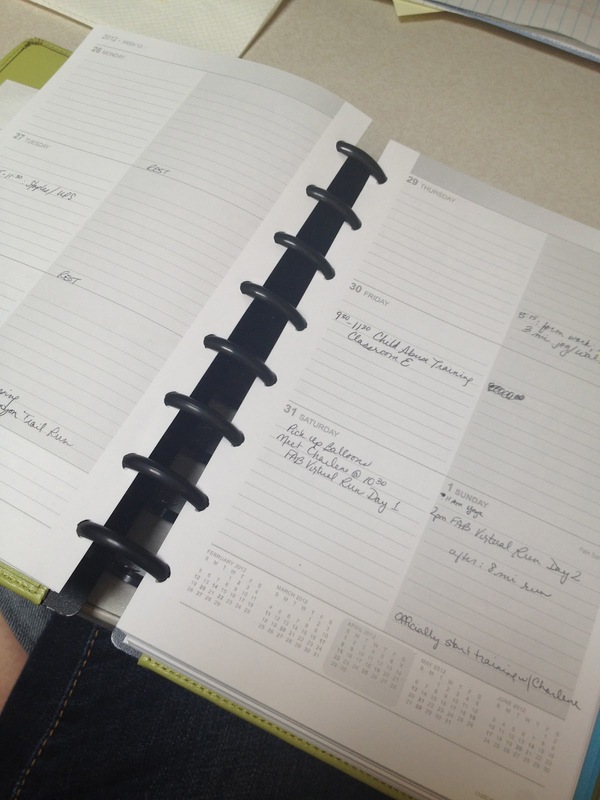 It came with a notebook, I added the calendar and to-do lists, so I could create what would work for me! Enjoy it if you get it, and good luck with organizing as well. It has been working great so far! Ange – THANK YOU! I went out and bought this system almost the day after I read your post! I was so excited. I LOVE IT! Only, I couldn’t remember what blog I found it on so I just now found you to let you know (since I am sick and perusing recent updates). This is a great system, and I love your ideas for how you are going to use it. It gave me a few to do with mine too. I added a calendar (LOVE), To-Do lists and the little list pads too. I want them to make a nutrition/workout log too, which I have seem some of the more expensive/designer lines have. This was really reasonably priced too for what you get. I picked the pink leather one and added the largest rings for now. Thank you! I have you marked as a favorite now so I can find your quicker next time. 😉 Have a great weekend! 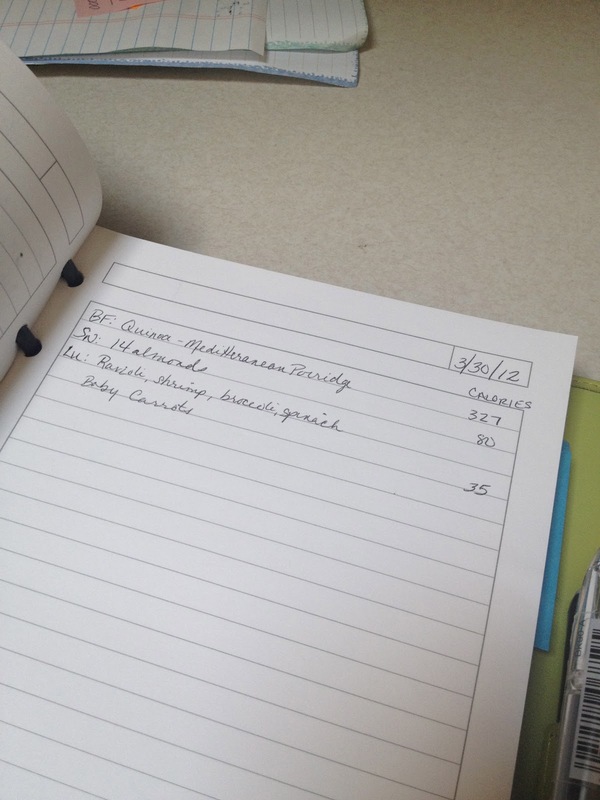 I LOVE the idea of them creating a nutrition/workout log! That would be great. I may email them about that. I am glad you love it as much as I do… it has been a huge help for me, even in a few short weeks. Have a great week! And hope you are feeling better! !